Showing items in category Samoa, sorted by newest listed first. SAMOA - 1942 2d rate non censored cover to UK used at MALUA/SAMOA. 1942 (AP.5.) 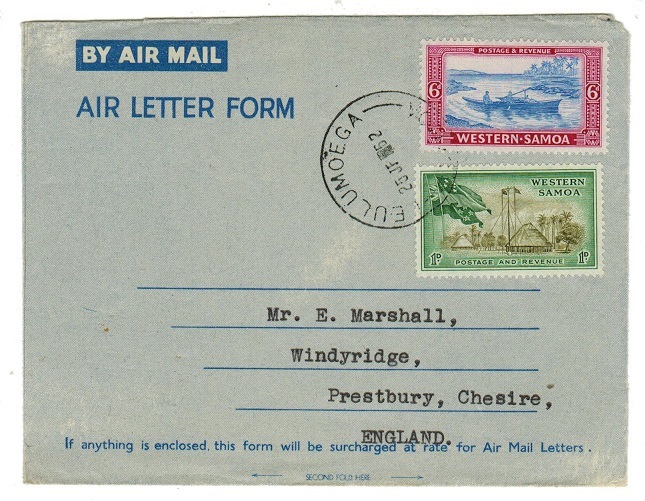 cover addressed to UK (central fold) bearing 2d adhesive tied by MALUA/SAMOA cds with APIA transit b/s. SAMOA - 1916 1/2d + 1/2d green PSRC unused. 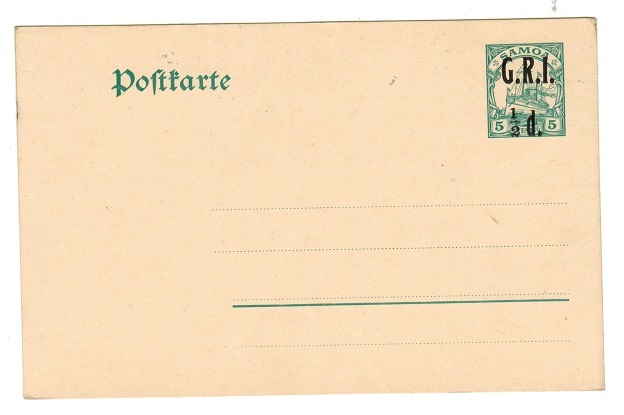 1916 1/2d+1/2d green on cream postal stationery reply postcard in unused condition overprinted 'G.R.I.' in black for the use by the military forces during occupation. H&G 3. SAMOA - 1921 1d IMPERFORATE PLATE PROOF in blue. 1921 1d 'Native Hut' IMPERFORATE PLATE PROOF (SG type 16) printed in blue on ungummed cream paper. SAMOA - 1921 6d IMPERFORATE PLATE PROOF in blue. 1921 6d 'Native Hut' IMPERFORATE PLATE PROOF (SG type 16) printed in blue on ungummed cream paper. SAMOA - 1921 9d IMPERFORATE PLATE PROOF in blue. 1921 9d 'Native Hut' IMPERFORATE PLATE PROOF (SG type 16) printed in blue on ungummed cream paper. SAMOA - 1921 1/- IMPERFORATE PLATE PROOF in blue. 1921 1/- 'Native Hut' IMPERFORATE PLATE PROOF (SG type 16) printed in blue on ungummed cream paper. SAMOA - 1917 5d rate registered censored cover to UK. 1917 (MY.11.) registered (Wilson) cover to UK bearing 2 1/2d adhesive pair of New Zealand overprinted SAMOA in red tied by APIA cds and with light green boxed PASSED BY/CENSOR/ 2 G.R.I. Handstamp below. SAMOA - 1935 1/2d 'pictorial' adhesive on illustrated cover to New Zealand. 1935 (AU.7.) 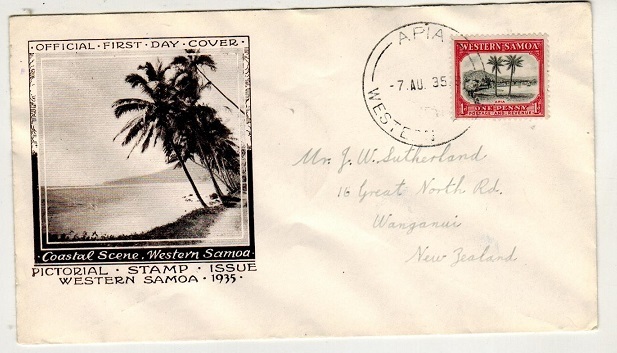 illustrated first day cover addressed to New Zealand bearing 1/2d 'pictorial' (SG 180) tied APIA/WESTERN SAMOA. SAMOA - 1935 1d 'pictorial' on illustrated cover to New Zealand. 1935 (AU.7.) 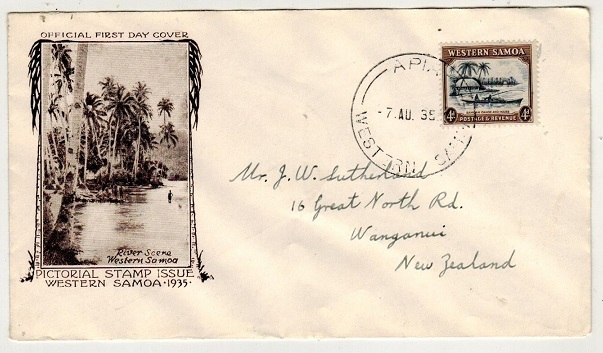 illustrated first day cover addressed to New Zealand bearing 1d 'pictorial' (SG 181) tied APIA/WESTERN SAMOA. SAMOA - 1935 2d 'pictorial' on illustrated cover to New Zealand. 1935 (AU.7.) illustrated first day cover addressed to New Zealand bearing 2d 'pictorial' (SG 182) tied APIA/WESTERN SAMOA. 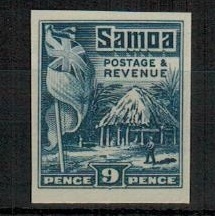 SAMOA - 1935 (AU.7.) illustrated first day cover addressed to New Zealand. 1935 (AU.7.) 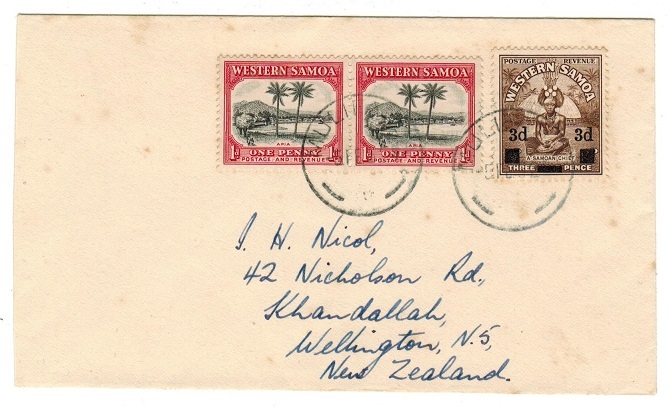 illustrated first day cover addressed to New Zealand bearing 2 1/2d 'pictorial' (SG 183) tied APIA/WESTERN SAMOA. SAMOA - 1935 4d 'pictorial' on illustrated cover to New Zealand. 1935 (AU.7.) 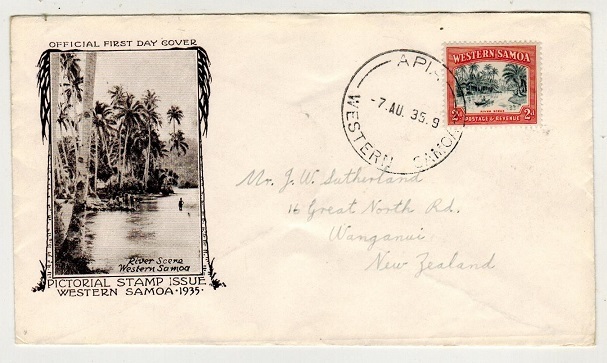 illustrated first day cover addressed to New Zealand bearing 4d 'pictorial' (SG 184) tied APIA/WESTERN SAMOA. SAMOA - 1893 '5d' FOURNIER proof strikes taken from his forgery handbook. 1893 FOURNIER strikes of the '5d' and 'Five Pence' handstamps printed in black on cream card taken from the Fournier forgery handbook. SAMOA - 1948 2/- rate cover to USA used at LOTOFAGA. 1948 (NO.30.) cover addressed to USA (light horizontal fold) bearing 2/- 'pictorial' adhesive tied by LOTOFAGA/SAMOA cds. A scarce use of this high value from Lotofaga. SAMOA - 1935 'Pictorial' set (ex 1/-) on 8 covers to UK. 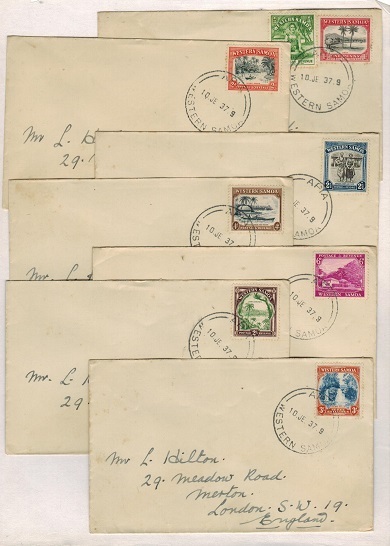 1935 'Pictorial' set (SG 180-8 / ex 1/-) arranged on 8 covers addressed to UK and each cancelled by APIA/WESTERN SAMOA cds's dated 10.JE.37. 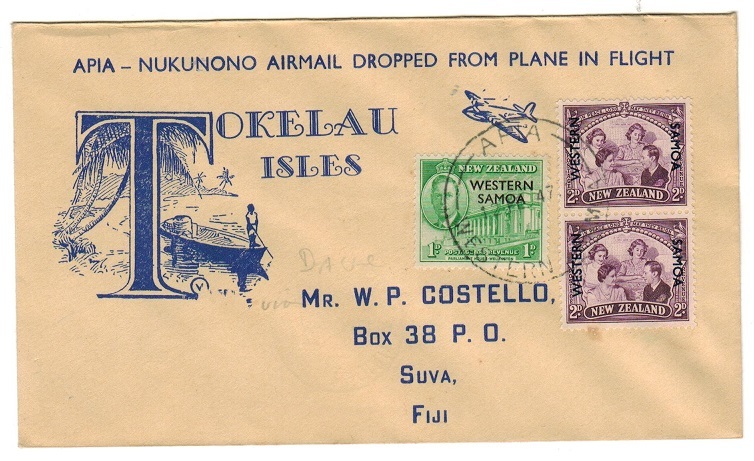 SAMOA - 1947 first flight cover to Fiji. 1947 (MR.2.) 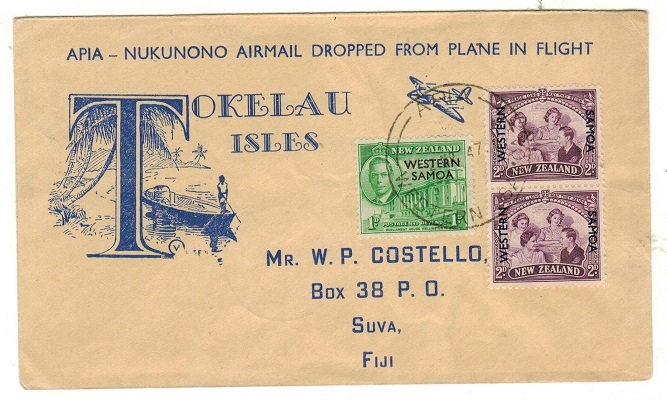 illustrated first flight cover addressed to Fiji pre-printed 'Apia-Nukunono Airmail Dropped From Plane in Flight' bearing 1d and 2d pair of New Zealand overprinted WESTERN SAMOA and tied APIA/WESTERN SAMOA with NUKUNONO/UNION ISLANDS transit cds on the reverse side of the following day on its arrival at Tokelau. SAMOA - 1914 2 1/2d on 20pfg blue used strip of three showing the MISSING FRACTION BAR. SG 104a. 1914 2 1/2d on 20pfg blue in a fine vertical strip of three tied to piece by part APIA/SAMOA cds's with the center stamp showing the MISSING FRACTION BAR. SG 104a. SAMOA - 1914 1/2d on 5pfg green used strip of three showing the MISSING FRACTION BAR. SG 102b. 1914 1/2d on 5pfg green in a fine vertical strip of three tied to piece by APIA/SAMOA cds's dated 12.9.14 and with the center stamp showing the MISSING FRACTION BAR. SG 102b. Scarce as this was repaired on this value on later printings. SAMOA - 1914 1/2d on 3pfg brown used strip of three showing MISSING FRACTION BAR. SG 101b. 1914 1/2d on 3pfg brown in a fine vertical strip of three tied to piece by APIA/SAMOA cds's dated 12.9.14 and with the center stamp showing the MISSING FRACTION BAR. SG 101b. SAMOA - 1896 1d blue 'Private Printing' PSC genuinely used at APIA. H&G 1. 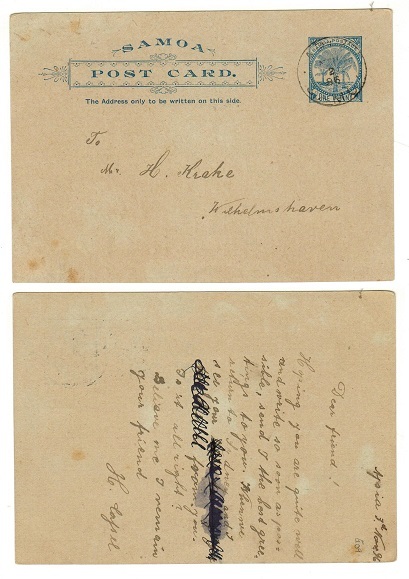 1896-98 1d blue on thin greyish buff stock paper postal stationery postcard 'Privately Printed' by John Davis addressed to Wilhelmshaven (genuine message on reverse) and cancelled by APIA/SAMOA cds dated NOV.2.96. Few cards were printed and used examples are rare. H&G 1. SAMOA - 1942 local 'FDC' bearing 1d adhesive used at FALEFA. 1942 (AU.1.) cover addressed locally marked 'First Day Cover' and bearing 1d adhesive tied by FALEFA/WESTERN SAMOA cds. SAMOA - 1898 1d + 1d red PSRC unused. 1898 1d + 1d red on buff stock postal stationery reply type postcard printed locally by John Davis for the local posts in fine unused condition with perforation type 10. Exceedingly scarce with only 250 copies printed. Few exist of this reply card. SAMOA - 1916 1/2d on 5pfg green 'GRI' military PSC unused. H&G 1. 1916 1/2d black on 5pfg green on cream "G.R.I." overprinted 'Military Occupation' postal stationery postcard in fine unused condition. H&G 1. SAMOA - 1916 1d + 1d red 'GRI' military PSRC unused. H&G 4. 1916 1d+1d black on 10pfg+10pfg carmine on cream "G.R.I." overprinted 'Military Occupation' postal stationery reply type postcard in fine unused condition. H&G 4. SAMOA - 1944 registered 'PASSED/DDA/23' censored cover to New Zealand. 1944 (OC.4) reg'd cover to New Zealand bearing 3d on 1 1/2d surcharge pair (SG199) tied by APIA/WESTERN SAMOA cds with scarce violet octagonal crowned PASSED/DDA/23 censor strike at right. SAMOA - 1937 'PAN AMERICAN AIRWAYS' first flight postcard produced by J.Atkins. 1937 (DE.31.) 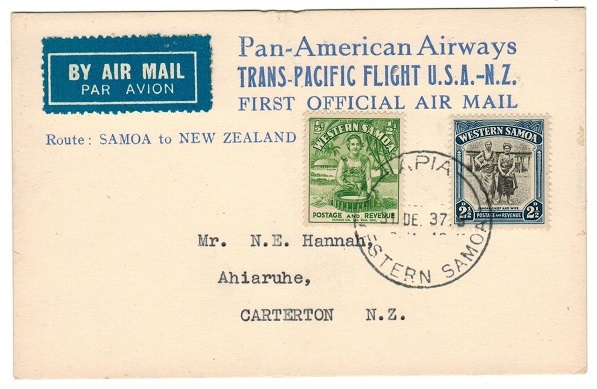 pre-printed PAN AMERICAN AIRWAYS/TRANS-PACIFIC FLIGHT first flight card (no message) addressed to New Zealand bearing 1/2d and 2 1/2d adhesives tied by APIA/WESTERN Samoa cds. A scarce card pre-pared by J.H.Adkins who was stationed at Apia at this time. No mails were sent to New Zealand and the flight was only operational for 10 days. 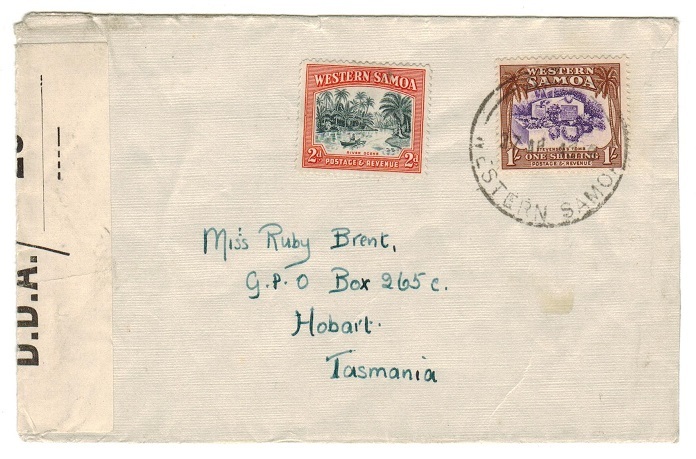 SAMOA - 1941 censor cover to Tasmania. 1941 (AP.27.) 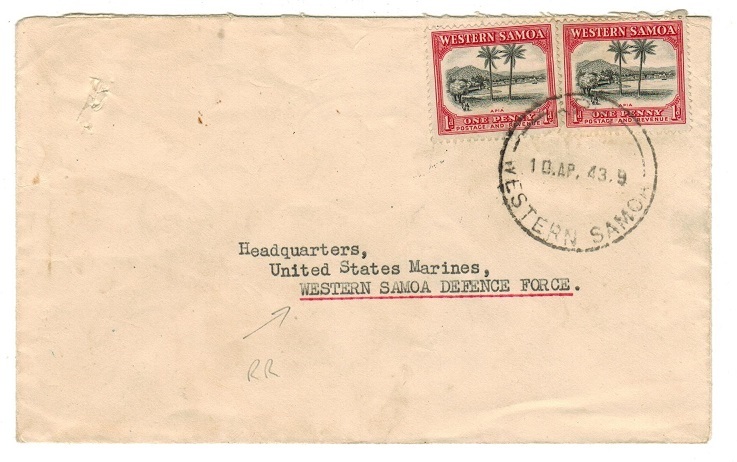 cover addressed to Yasmania bearing 2d and 1/- adhesives tied APIA/WESTERN SAMOA and with black on white P.C.90/OPENED BY EXAMINER/ D.D.A./23 censor label at left. 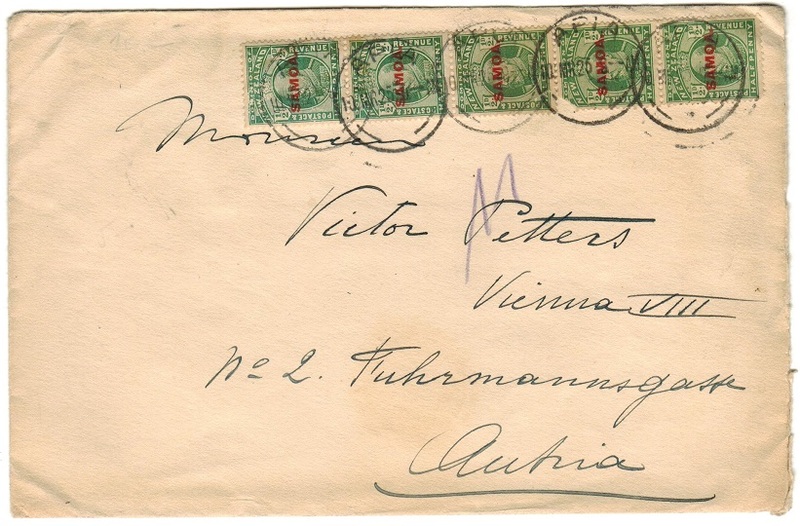 SAMOA - 1920 2 1/2d rate cover to Austria used at APIA. 1920 (MR.10.) 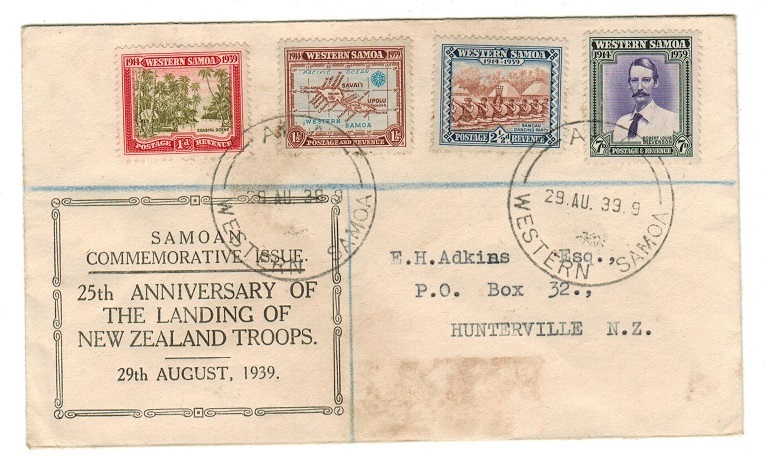 cover addressed to Austria bearing a fine strip of five of the 1/2d green of New Zealand (field marshall) overprinted SAMOA in red and tied by APIA/NZ cds's. 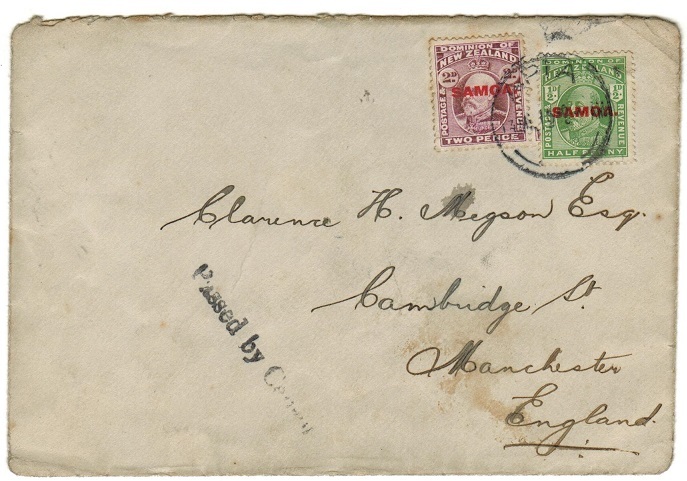 SAMOA - 1918 2 1/2d rate censor cover to UK. 1918 (ME.13.) 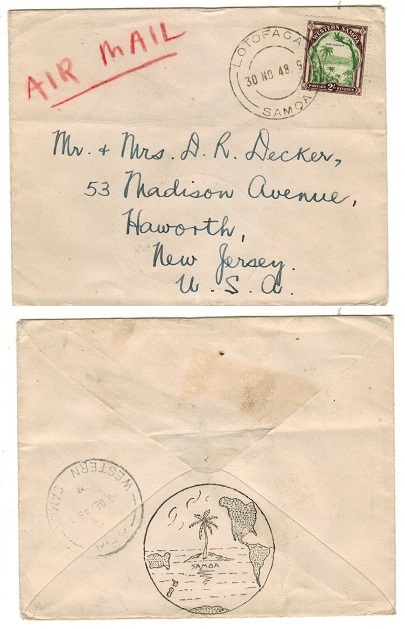 cover addressed to UK (a little worn) bearing 1/2d and 2d adhesives (SG 115+117) tied by APIA cds with black straight lined PASSED BY CENSOR handstamp at lower left. (Collins type SC 4). 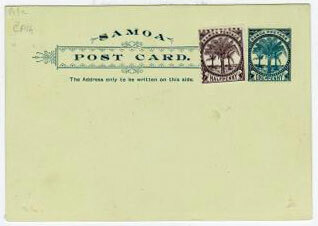 SAMOA - 1896 1d blue PSC unused. H&G 1. 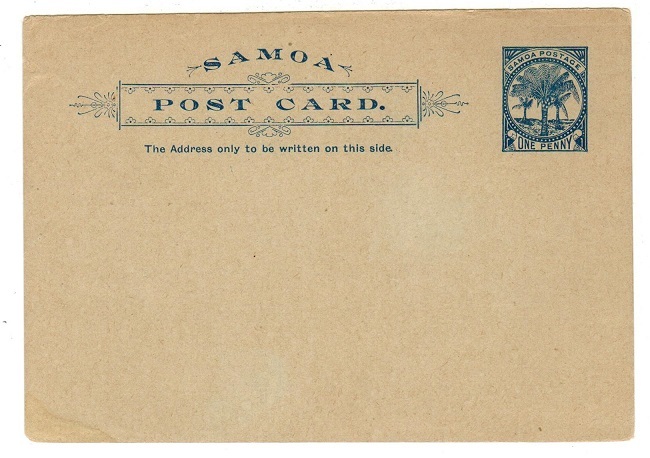 1896-98 1d blue on BUFF stock paper postal stationery postcard printed privately by J.Davis for the local Samoa posts in fine unused condition. Only 216 cards were printed. Very small edge tear at top left. H&G 1. SAMOA - 1920 (circa) unused postcard. 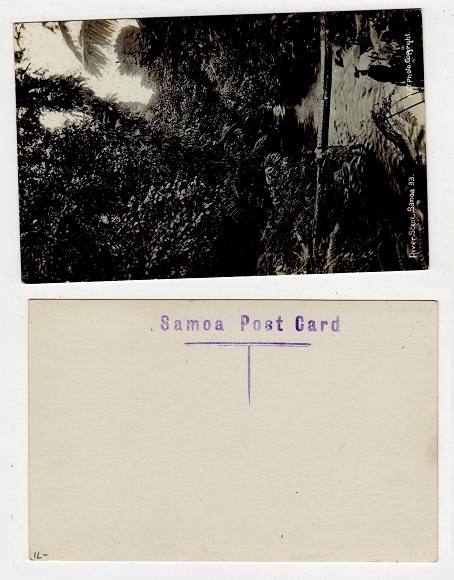 1920 circa black & white real picture postcard depicting 'River Scene, Samoa No.33' with violet SAMOA POST CARD h/s applied to reverse. A A.J.T. Photo. 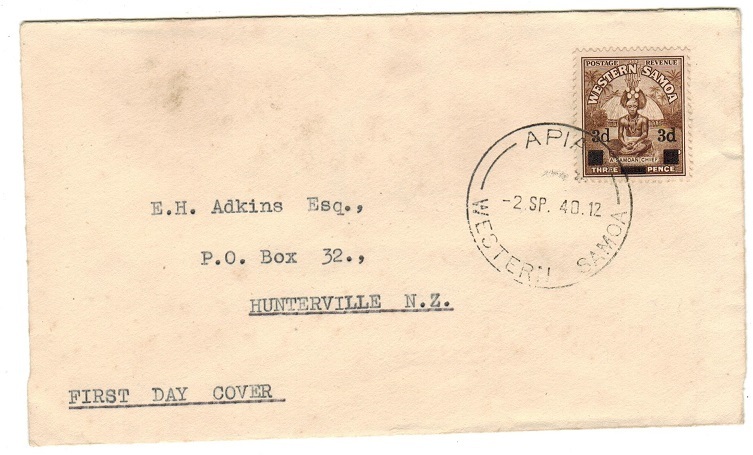 SAMOA - 1944 censored cover to Australia used at APIA. 1944 (JA.4.) 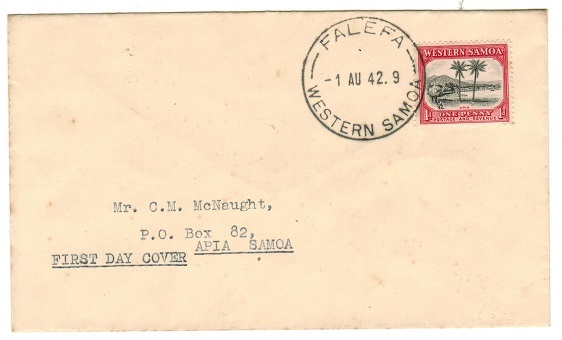 cover addressed to Australia bearing 2d adhesive tied by APIA.WESTERN SAMOA cds with black on cream P.C.90/OPENED BY EXAMINER/ D.D.A./23 censor label at left which was allocated for Samoa mails. (Little type L2). 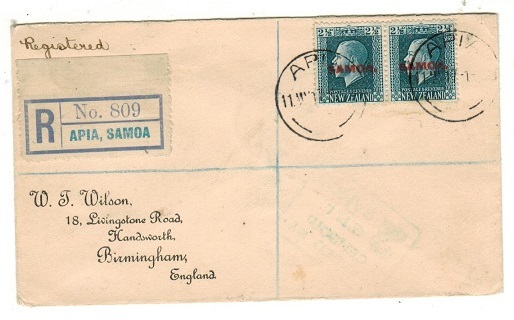 SAMOA - 1942 censored cover to UK used at APIA. 1942 (JE.10.) 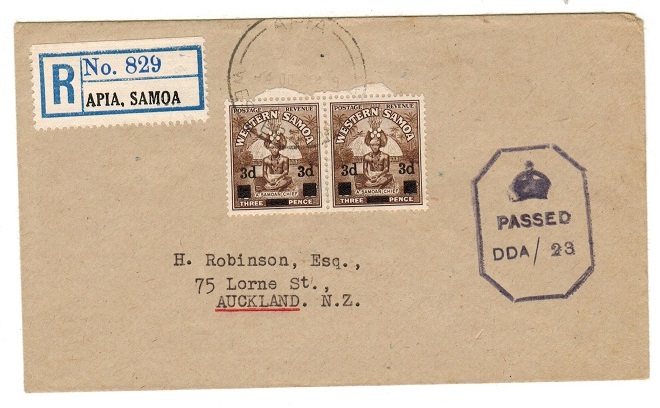 cover addressed to UK bearing 4d adhesive tied APIA/WESTERN SAMOA with black on cream OPENED BY CENSOR IN NEW ZEALAND censor strip at left tied on the front by violet PASSED BY CENSOR NZ/46 circular h/s. SAMOA - 1939 'Landing Of NZ Troops' commemoration cover to New Zealand. 1939 (AU.29.) pre-printed '25th Anniversary Of The Landing Of New Zealand Troops' first day cover bearing the set of four (SG 195-198) tied by APIA cds. A little staining from gum. 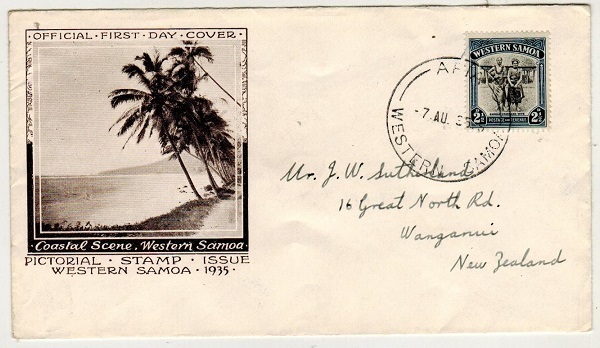 SAMOA - 1940 3d on 1 1/2d surcharge FDC cover addressed to New Zealand. 1940 (SP.2.) 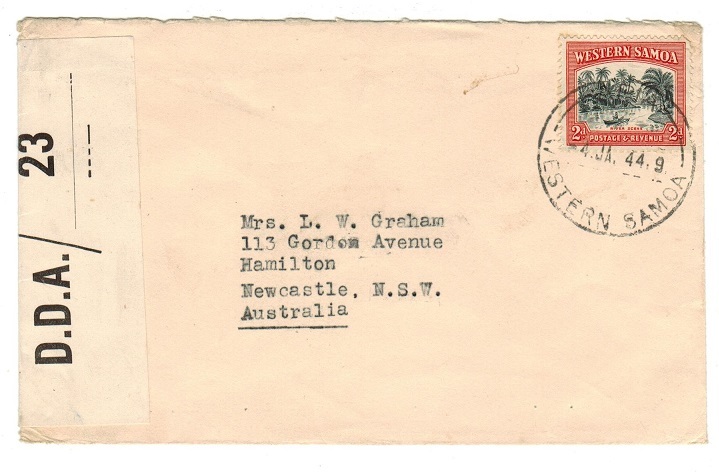 first day cover addressed to New Zealand of the 3d on 1 1/2d brown (SG 199) surcharge adhesive tied APIA. SAMOA - 1901 10pfg PSC to Germany cancelled APIA/SAMOA. H&G 6. 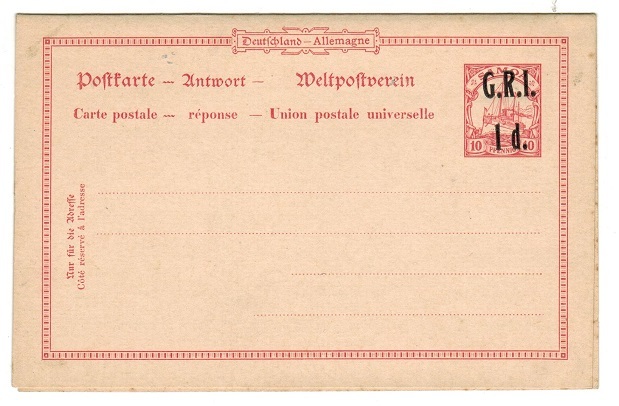 1901 10pfg carmine on cream 'yatch' postal stationery postcard of germany without control number addressed to germany with short but genuine message cancelled by neat APIA/SAMOA cds dated 13.1.02. H&G 6. 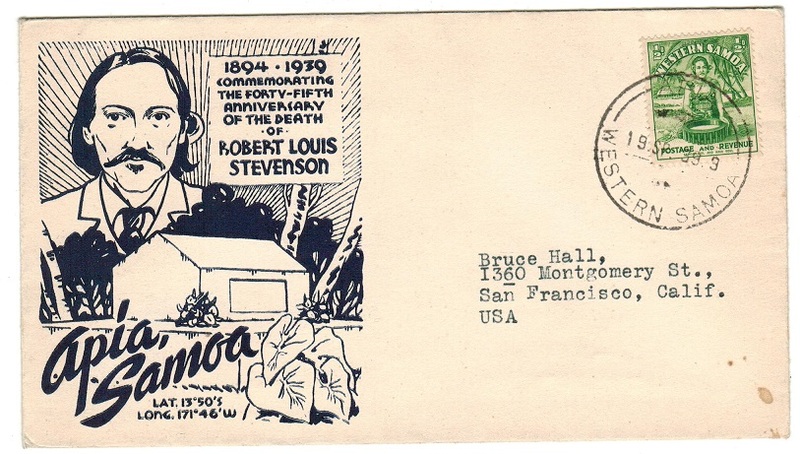 SAMOA - 1939 'Robert Louis Stevenson' illustrated commemoration cover to USA. 1939 (SP.19.) illustrated 'Commemorating Robert Louis Stevenson/Apia Samoa' envelope addressed to USA bearing 1/2d adhesive tied by APIA/WESTERN SAMOA cds. SAMOA - 1943 scarce uncensored local cover to the 'Samoa Defence Force'. 1943 (AP.10.) uncensored local cover addressed to the 'Western Samoa Defence Force' bearing 1d pair tied by APIA/WESTERN SAMOA cds. 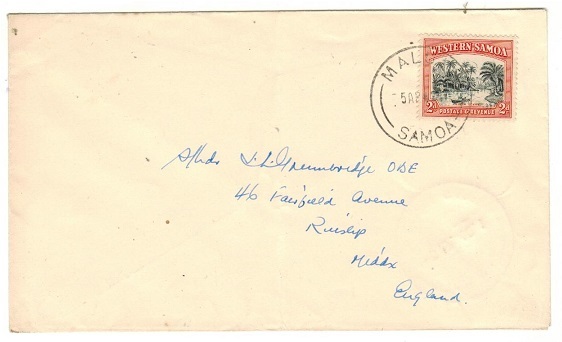 SAMOA - 1942 cover to New Zealand used at MULIFANUA. 1942 (FEB.5) cover to New Zealand bearing 1d adhesive pair tied in combination with the 3d on 1 1/2d surcharge by MULIFANUA cds's. The '42' being reversed in date slug. SAMOA - 1930 1d rate cover to Western Samoa used at MALUA/SAMOA. 1930 (AP.2.) 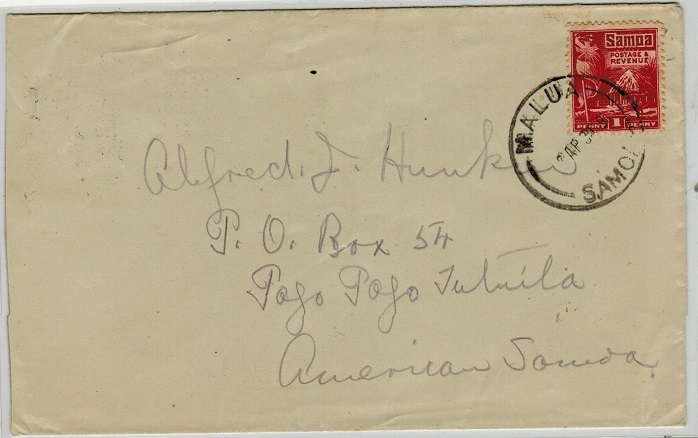 cover addressed to Tutuila at Pago Pago in American Samoa bearing 1d 'hut' adhesive tied by MALUA/SAMOA cds. SAMOA - 1935 2 1/2d rate cover to USA used at APIA. 1935 (SP.2.) 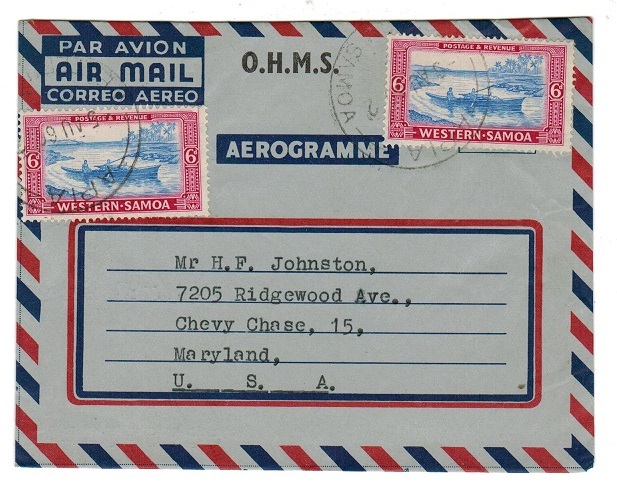 cover addressed to USA bearing 1/2d and 2d 'hut' adhesives tied by APIA/WESTERN SAMOA cds. SAMOA - 1937 1d rate MAUI POMARE maritime cover to USA with WELLINGTON PACKET BOAT cancel. 1937 (DE.15.) 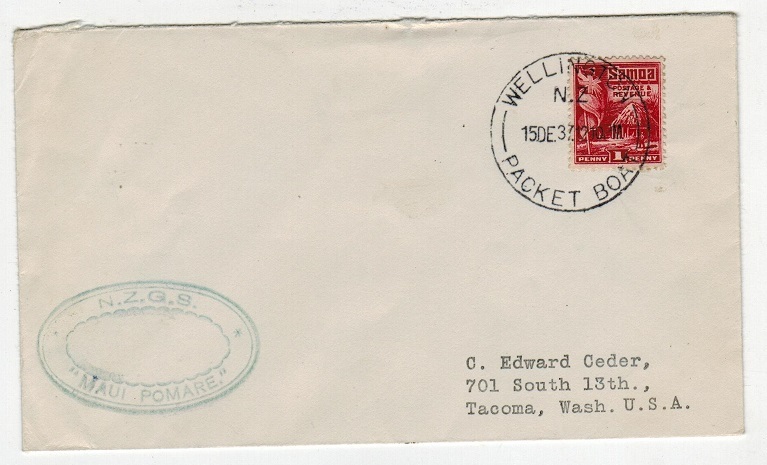 cover addressed to USA bearing 1d 'hut' adhesive tied by WELLINGTON/PACKET BOAT cds with green oval N.Z.G.S./MAUI POMARE maritime h/s at lower left. 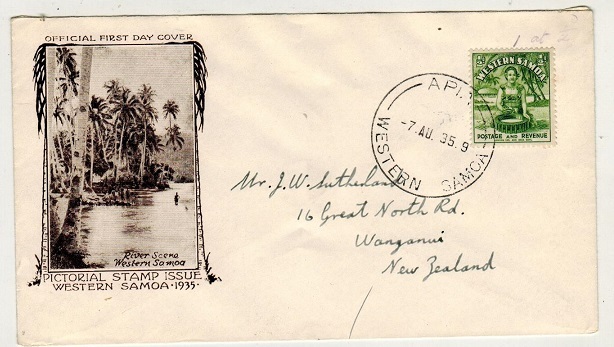 SAMOA - 1937 inward first flight cover from New Zealand. 1937 (DE.28.) inward first flight cover from New Zealand bearing 6d 'Coronation' adhesive tied by AUCKLAND/N.Z. 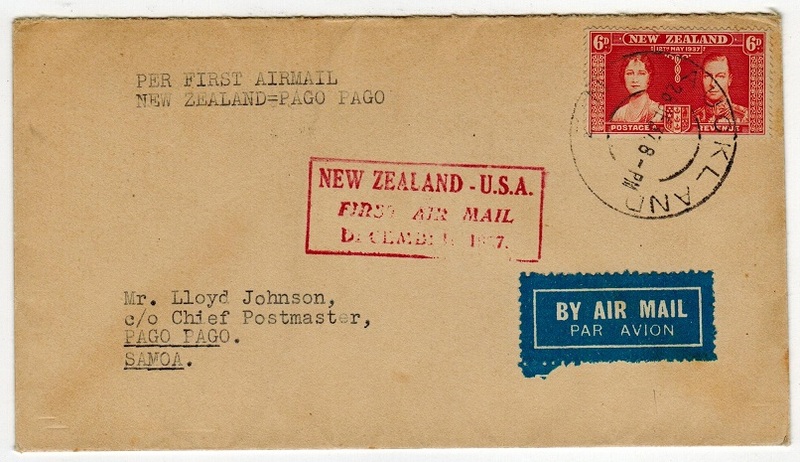 cds with red boxed NEW ZEALAND-USA/FIRST AIR MAIL/DECEMBER 1937 cachet applied PAGO PAGO/SAMOA arrival b/s. SAMOA - 1938 1d rate M.V.MATUN maritime cover to USA. 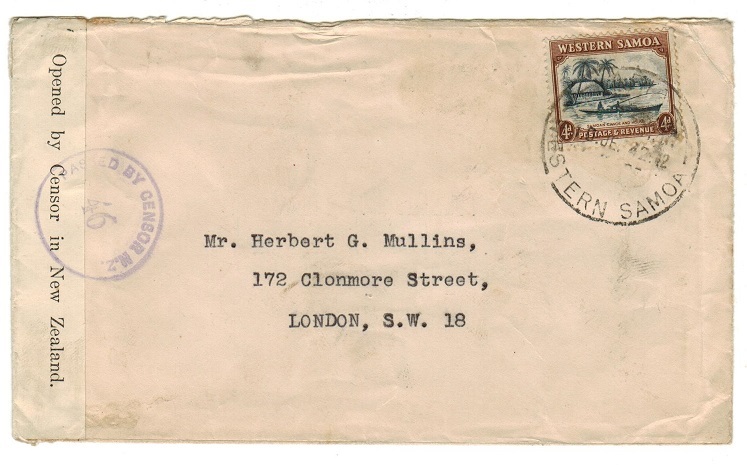 1938 (Mr.10) cover to USA bearing 1d (SG181) tied APIA-WESTERN SAMOA with green d/r PURSER'S OFFICE/M.V.MATUN maritime cachet. SAMOA - 1916 local philatelic cover with values to 6d used at APIA. 1916 (JE.14.) locally addressed philatelic cover bearing 1/2d, 1d, 2d, 2 1/2d and 6d adhesives of the 1914 overprint issue tied by individual APIA cds's. 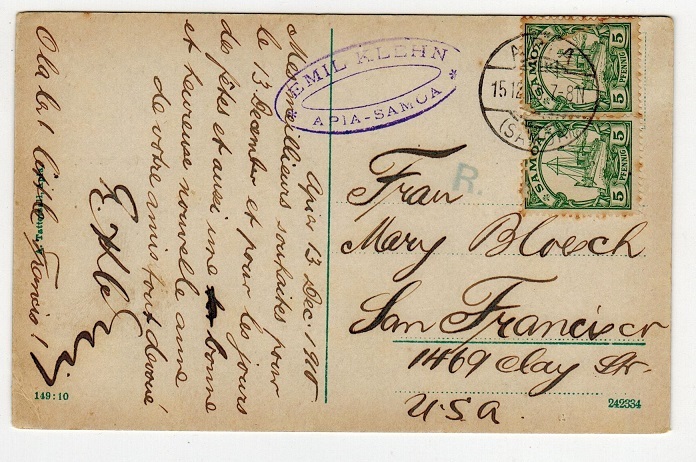 SAMOA - 1910 German 5pfg pair on postcard to USA used at APIA. 1910 (15.12.) 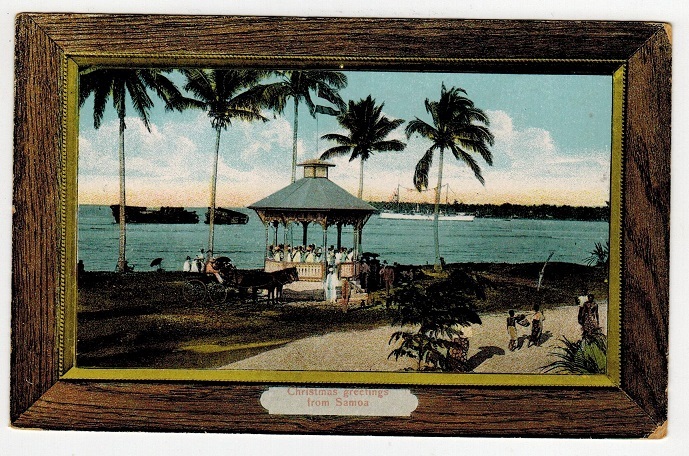 use of picture postrcard addressed to USA depicting coloured scene of harbour and marked 'Chritmas Greetings From Samoa' and struck by violet EMIL KLEHN/APIA-SAMOA h/s bearing German Samoa 5pfg green (x2) cancelled by APIA/(SAMOA) cds. The stamps have some tone marks on edges of perfs and one stamp in damaged. Green 'R' h/s at left. SAMOA - 1924 1d rate cover to USA used at APIA. 1924 (JL.14.) 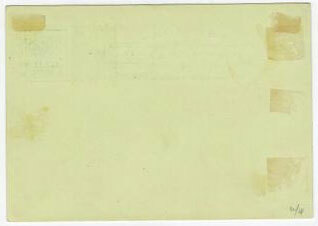 cover addressed to USA bearing 1d 'hut' adhesive tied by APIA cds. SAMOA - 1935 postcard of Pago Pago harbour. Text but unsent. 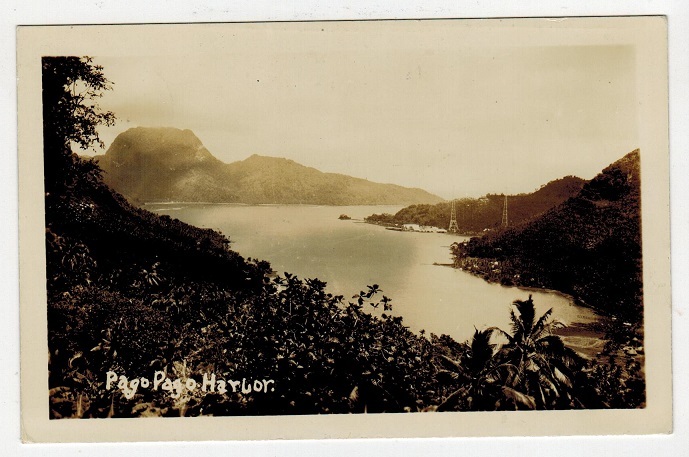 1935 real picture postcard depicting 'Pago Pago, harbour' with contemporary text on reverse but unsent. SAMOA - 1951 1d rate cover to New Zealand used at SATAUA. 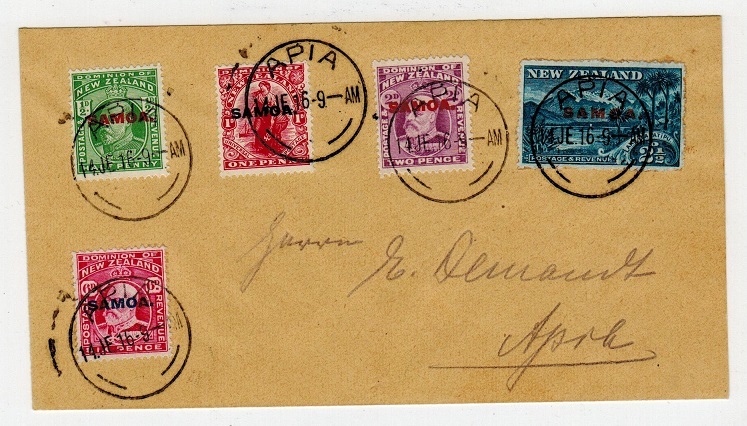 1951 (JA.30) cover to New Zealand bearing 1d (SG 181) tied SATAUA/SAMOA. Apia b/s. 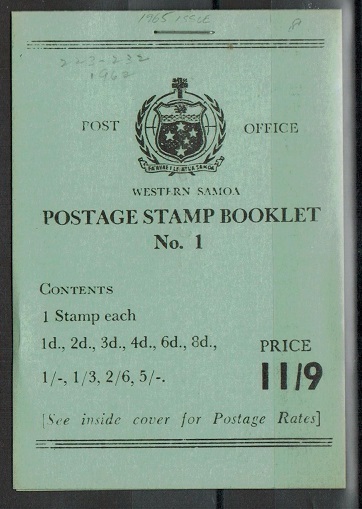 SAMOA - 1967 issue 11/9d BOOKLET. SG SB14. 1967 issue 11/9d black on green (No.1) POSTAGE STAMP BOOKLET (narrow issue) containing various stamps in cellophane bag. 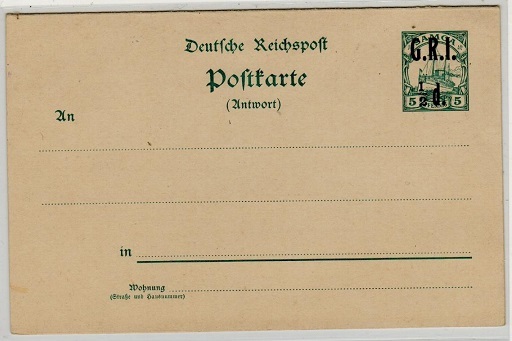 Imprinted on reverse 'Apprvd. 250/4/67-378'. Only 250 printed. SG SB14. 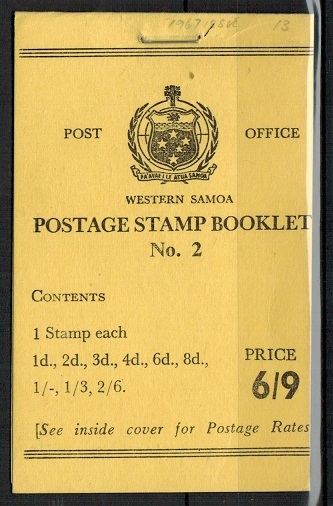 SAMOA - 1967 issue 6/9d BOOKLET. SG SB13. 1967 issue 6/9d black on yellow (No.2) POSTAGE STAMP BOOKLET (narrow issue) containing various stamps in cellophane bag. Imprinted on reverse 'Apprvd. 250/4/67-329'. Only 750 printed. SG SB13. 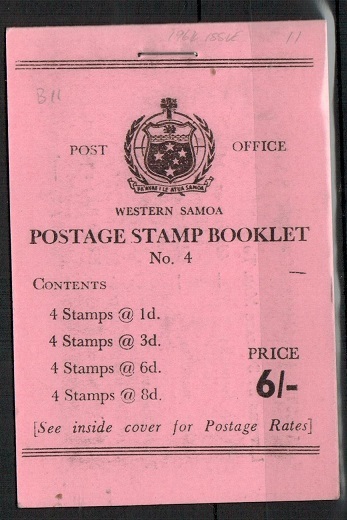 SAMOA - 1965 issue 6/- BOOKLET. SG SB11. 1964 issue 6/- black on pink (No.4) POSTAGE STAMP BOOKLET (narrow issue) containing various stamps in blocks of four. Imprinted on reverse '300/5/64-296'. SG SB9. 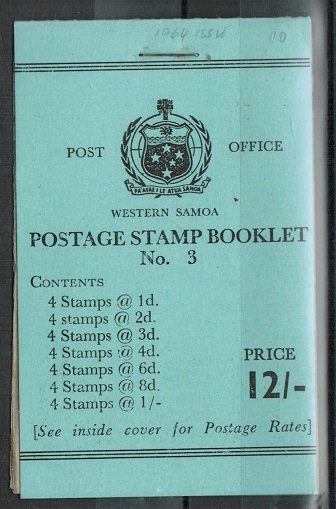 SAMOA - 1964 issue 12/- BOOKLET. SG SB10. 1964 issue 12/- black on blue POSTAGE STAMP BOOKLET No.3. (Narrow issue). Imprinted on reverse '300/5/64-296' on reverse. SG SB10. 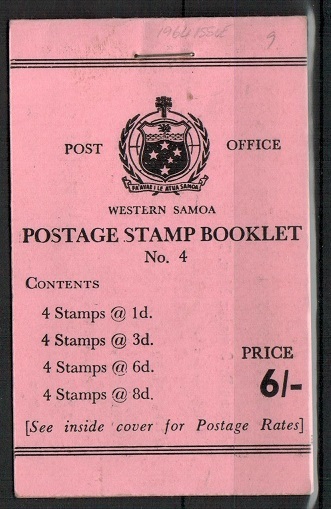 SAMOA - 1964 issue 6/- BOOKLET. SG SB9. 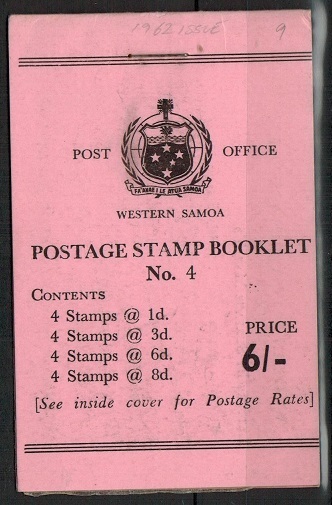 SAMOA - 1962 issue 6/- BOOKLET. SG SB9. 1962 issue 6/- black on pink (No.4) POSTAGE STAMP BOOKLET (narrow issue) containing various stamps in blocks of four. Imprinted on reverse '300/9/62-397'. SG SB9. 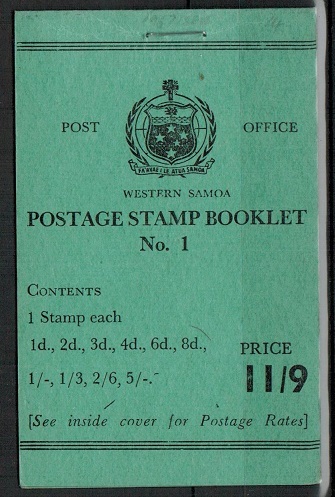 SAMOA - 1965 issue 11/9d BOOKLET. SG SB8. 1965 issue 11/9d black on green (No.1) POSTAGE STAMP BOOKLET (wide issue) containing various stamps officially enclosed in cellophane bag. Imprinted on reverse 'Appvd-500/2/65-79'. SG SB8. SAMOA - 1960 O.H.M.S/AEROGRAMME to USA used at APIA. 1960 (AU.5.) 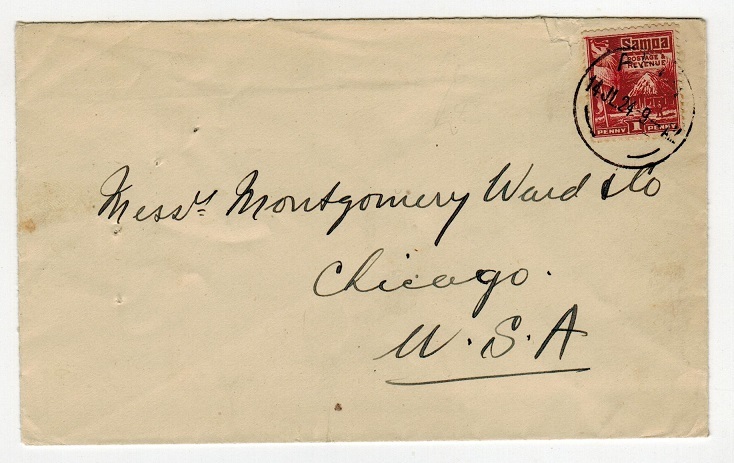 use of 'Croxley' O.H.M.S./AEROGRAMME envelope addressed to USA bearing 6d (x2) tied by APIA/SAMOA cds's. SAMOA - 1952 use of FORMULA type AIR LETTER FORM used at LEULUMOEGA. 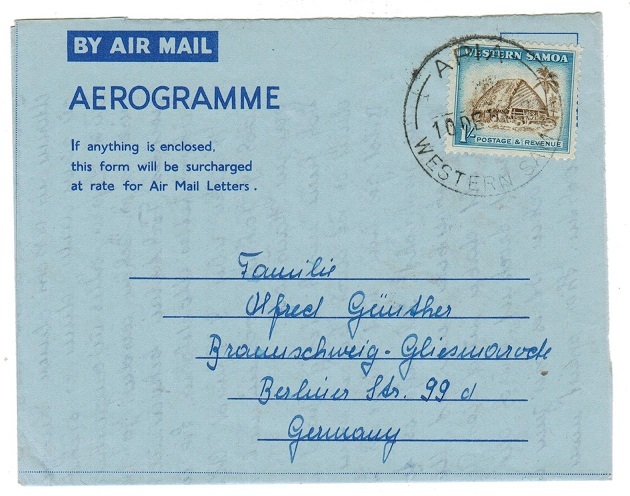 Formula AIR LETTER FORM addressed to UK (no message) bearing 1d & 6d (SG220+24) tied by LEULUMOEGA/SAMOA cds dated 25.JA.52. SAMOA - 1954 FORMULA type AEROGRAMME to Germany used at APIA. 1954 (DE.10.) 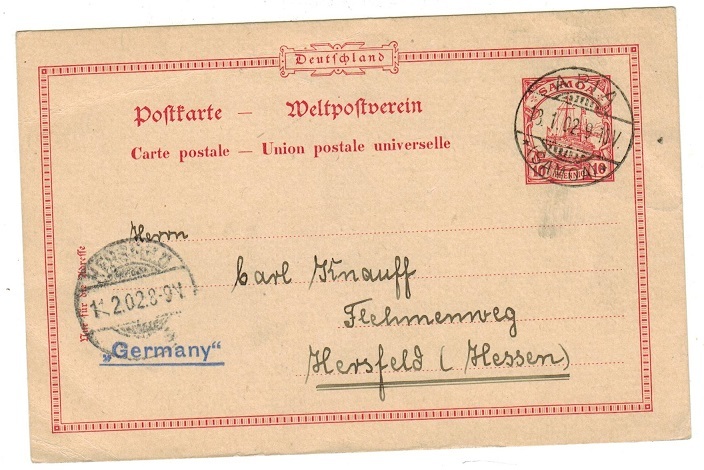 use of dark blue on blue FORMULA type AEROGRAMME addressed to Germany (genuine use) bearing 1/- adhesive tied by APIA/SAMOA cds. 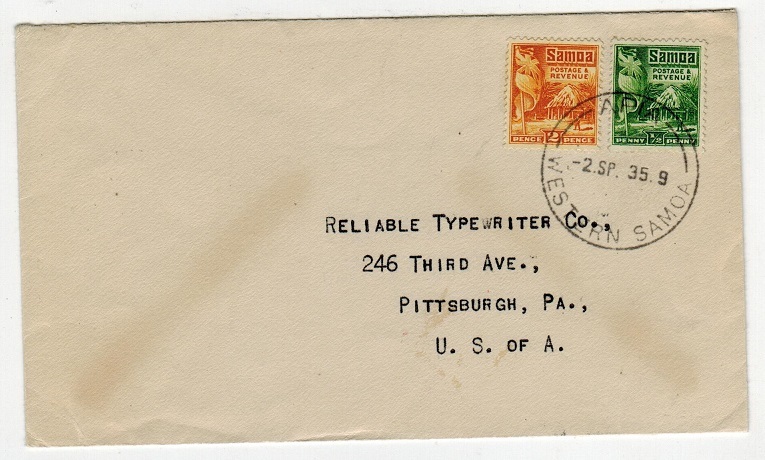 SAMOA - 1952 'M/S THORSISLE/SANDEFJORD' maritime cover to USA. 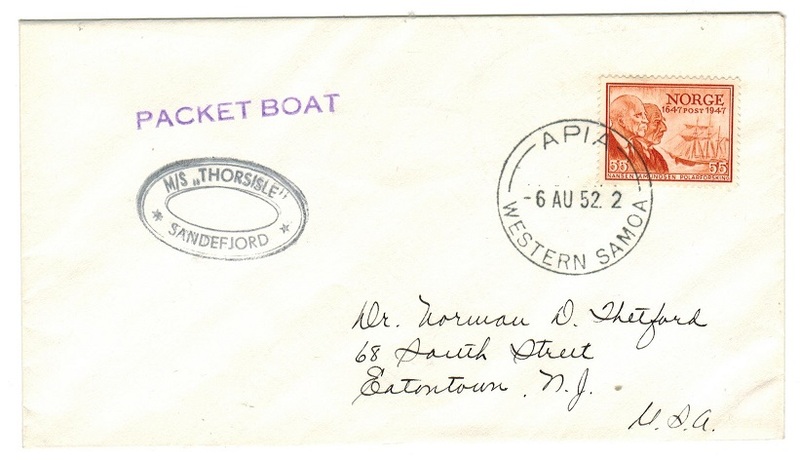 1952 (AU.6) cover to USA bearing Norway 55ore adhesive tied by APIA/WESTERN SAMOA cds with violet PACKET BOAT h/s at left & oval M/S THORSISLE/SANDEFJORD maritime marking. 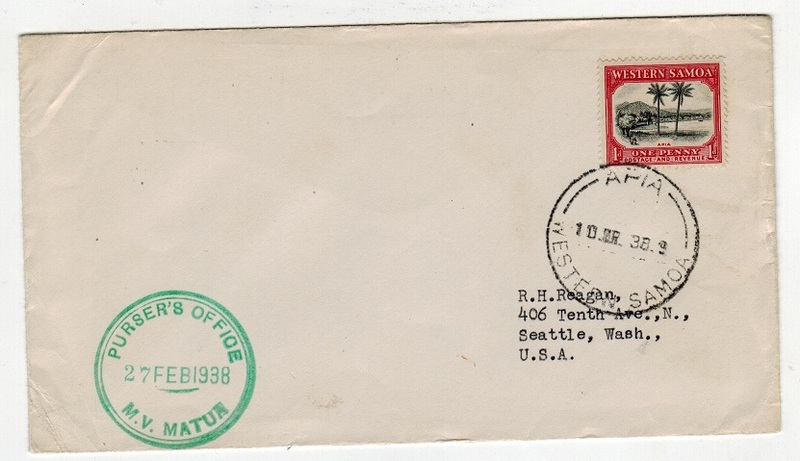 SAMOA - 1952 M/S THORSISLE maritime cover to USA. 1952 (DE.15) cover to USA bearing Norwegian 20 ore adhesives tied by APIA/WESTERN SOMOA cds & struck at left by blue PACKET BOAT h/s & black M/S THORSISLE maritime strike. 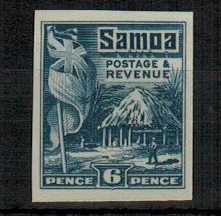 SAMOA - 1952 'Pictorial' set in IMPERFORATE PLATE PROOFS (Ex Bradbury Wilkinson). 1952 'Pictorial' series of 10 values (SG 219-228) all in IMPERFORATE PLATE PROOFS each printed in the issued colours on thick card. All ex Bradbury Wilkinson. A scarce series. SAMOA - 1952 OFFICIAL/APIA/P&T/PAID registered cover to USA from APIA. 1952 (JE.20) long stampless O.H.M.S. 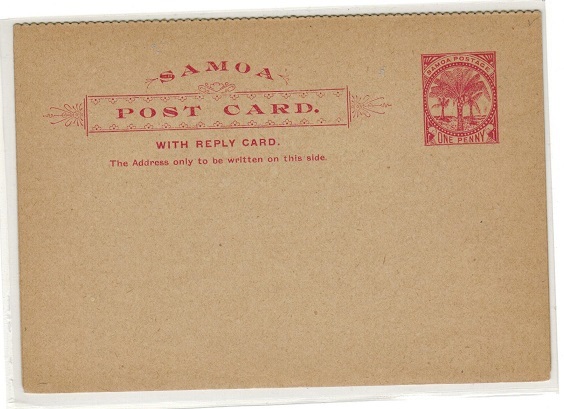 envelope reg'd to USA cancelled by APIA/WESTERN SAMOA cds with scarce blue d/r OFFICIAL PAID/APIA P&T DEPT h/s. SAMOA - 1942 US/NAVY-MARINES/HAVE LANDED h/s used at Base Depot on Samoa. 1942 (NOV.26.) 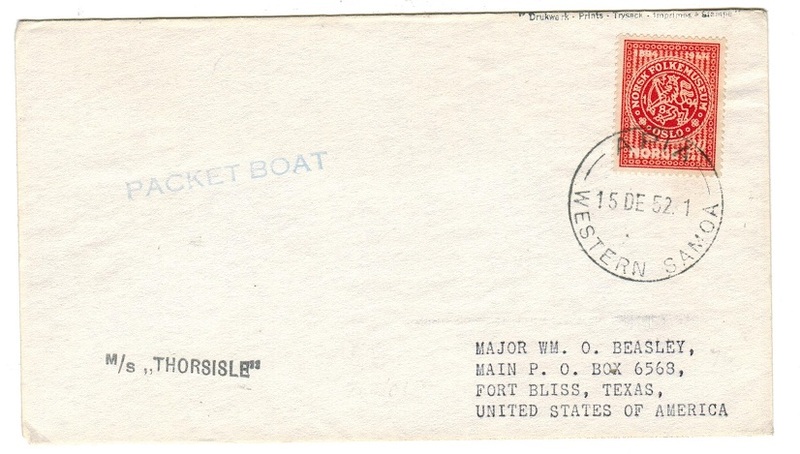 long stampless cover addressed to USA from a member of the US Marine Corps Unit 585 cancelled by US/NAVY-MARINES/HAVE LANDED h/s used at the Base Depot. Burge type U.
SAMOA - 1952 6d (SG 224) 'Pulled' PROOF handstamped B.W.ARCHIVES/IMPRIMATURE on reverse. 1952 6d (SG224) PROOF PULL of the frame & value tablet in black on unwatermarked gummed paper (69x57mm) h/s'd at top right '163'. Smudged ink & struck on reverse in brown-red ink B.W.ARCHIVES/IMPRIMATURE. SAMOA - 1958 'Inauguration' trio in IMPERFORATE PLATE PROOF blocks of four. 1958 'Inauguration of Samoan Parliament' trio in superb IMPERFORATE PLATE PROOF pairs printed on gummed wmk'd paper. SG 236-238. Very scarce. SAMOA - 1952 5d IMPERFORATE PLATE PROOF pair. 1952 5d IMPERFORATE PLATE PROOF horizontal pair of the tooth-billed pigeon adhesive (SG 223) printed in the issued colours of brown and deep green on watermarked gummed paper. SAMOA - 1952 2d IMPERFORATE PLATE PROOF block of four. 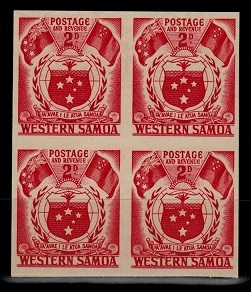 1952 2d 'Seal Of Samoa' (SG 221) in a fine IMPERFORATE PLATE PROOF block of four printed in issued colour on thick cream card. 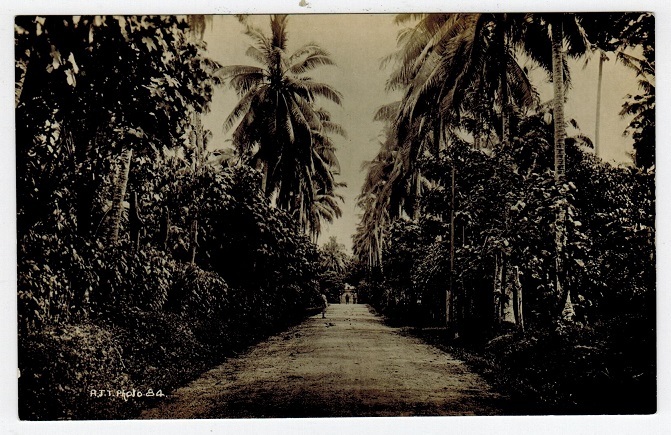 SAMOA - 1910 (circa) unused picture postcard depicting local roadway. 1910 circa black and white picture postcard with blank reverse handstamped in violet 'Samoa Post Card' and marked 'A.T.T. Photo 84' on front depicting local roadway in fine unused condition. 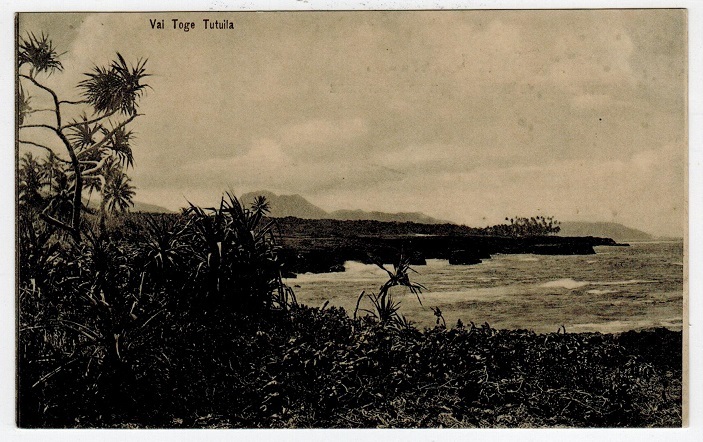 SAMOA - 1905 unused picture postcard depicting 'Vai Toge Tutuila'. 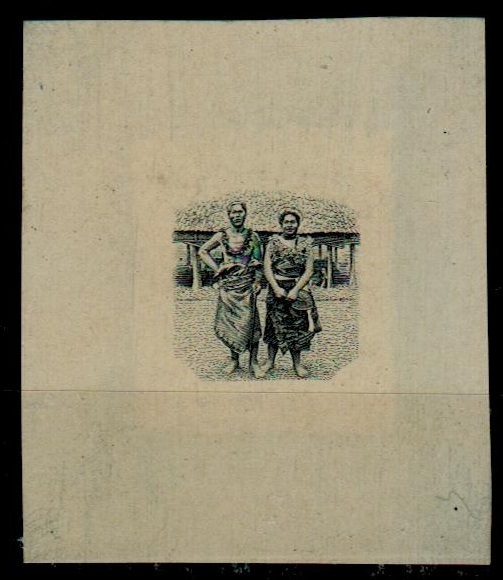 1905 (issue) black and white picture postcard printed by 'T.Andrew, Apia (Samoa)' depicting Vai Toge Tutuila in fine unused condition. SAMOA - 1877 'Samoa Express' FOURNIER forgeries. 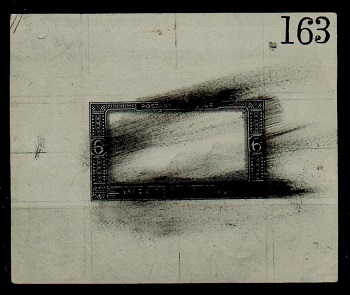 1877-90 Samoa Express (SG type 1) range of Fournier forgeries from state 3 arranged on small piece. 1d, 2d (unissued), 3d, 6d, 9d, 1/-, 2/- & 5/- values in unused condition. Some small faults. 8 items. SAMOA - 1910 piece with New South Wales 1d (x3) tied APIA. 1910 (23.12) piece bearing New South Wales 1d (x3) adhesives (SG type 62) tied by two fine strikes of the APIA/(SAMOA) bridge type German cancel. 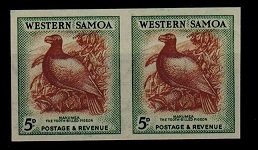 A scarce use of these stamps in Samoa. 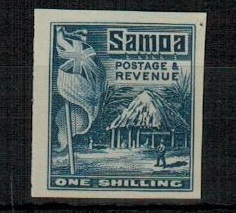 SAMOA - 1916 2 1/2d blue 'two perf' vertical used pair. SG 139b. 1916 2 1/2d blue vertical pair showing the two perforation types (139+139a) cancelled by APIA cds. A scarce format in used condition. SG139b. SAMOA - 1916 3d chocolate 'two perf' vertical used pair. SG 140b. 1916 3d chocolate vertical pair showing the two perforation types (140+140a) cancelled by APIA cds. A scarce format in used condition. SG140b. SAMOA - 1916 6d carmine 'two perf'vertical used pair. SG 141b. 1916 6d carmine vertical pair showing the two perforation types (141+141a) cancelled by neat APIA cds's. A scarce format in used condition. SG140b. SAMOA - 1916 1/- vermilion 'two perf' vertical used pair. SG 142b. 1916 1/- vermilion vertical pair showing the two perforation types (142+142a) in fine used condition. A scarce format used. SG142b. 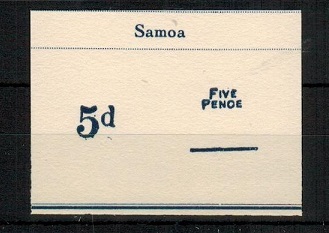 SAMOA - 1895 piece with surcharges used at APIA. 1895 piece bearing two examples of the locally h/s'd 1 1/2d on 2d (SG78) & a copy of the 3d on 2d (SG79) tied by two fine strikes of the APIA/SAMOA cds. 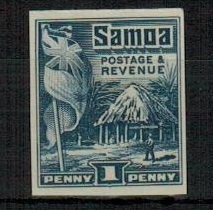 SAMOA - 1935 2 1/2d IMPERFORATE PLATE PROOF on centre design. (SG type 21). 1935 2 1/2d IMPERFORATE DIE PROOF of the centre vignette (SG type 21) printed in black on thin card (40 x 46mm). Fine and scarce. Ex De La Rue. SAMOA - 1921 'Native Huts' IMPERFORATE PLATE PROOF pairs. SG 153-164. 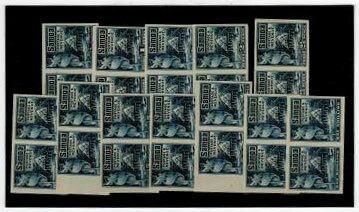 1921 'Native Hut' IMPERFORATE PLATE PROOF horizontal pairs (SG type 16) printed in dark blue on cream paper. The 2 1/2d pair being affixed to card. (SG 153-64). Only 1 sheet was printed. (24 proofs). A lovely and very scarce series. 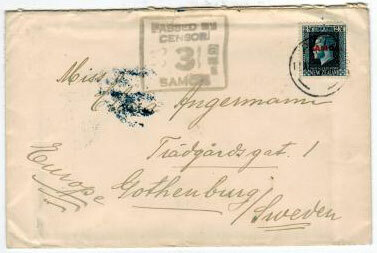 SAMOA - 1920 PASSED BY CENSOR 3/SAMOA cover to Sweden. 1920 (AP.11.) 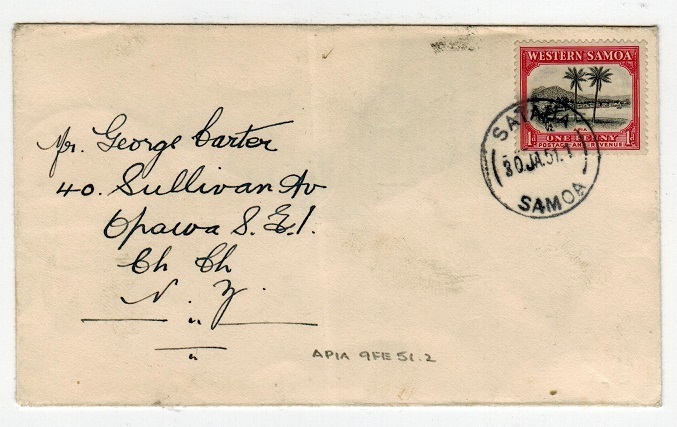 cover addressed to Sweden (scarce) bearing 2 1/2d New Zealand 'head' adhesive overprint SAMOA in red and tied APIA with black boxed PASSED BY/CENSOR/GRI/3/SAMOA censor handstamp applied below. SAMOA - 1896 1d + 1/2d uprate PRIVATE (Davis) PSC unused. H&G 1. 1896-98 1d blue on bright pale greenish card in fine unused condition with additional 1/2d 'Palm' issue added officially alongside. Privately produced by J.Davis for private posts. Hinged on reverse but a scarce card. H&G 1.